AEDBF France organized a conference on “Data at the time of the PSD2 and the GDPR” which will be held on October 9, 2018. AEDBF Belgium – Conference on MiFID II “The proof of the pudding is in the eating” – 31 May 2018 – Save the Date! Continue reading AEDBF Belgium – Conference on MiFID II “The proof of the pudding is in the eating” – 31 May 2018 – Save the Date! AEDBF Italy – Conference on State aid and bank crisis – Siena – 26th January 2018 – Save the date! The Italian Committe of European Society for Banking and Financial Law and the University of Siena organized a conference on State aid and bank crisis, which will be held in Siena on 26th January 2018. Continue reading AEDBF Italy – Conference on State aid and bank crisis – Siena – 26th January 2018 – Save the date! The European Society for Banking and Financial Law Luxembourg (AEDBF Luxembourg) organized the conference “MIFID II A NOTRE PORTE” which was held in Luxembourg on 28th November 2017. Conference “The metamorphosis of cooperative credit” – 6th and 7th October – Naples – Save the date! The European Society for Banking and Financial Law – Italy (AEDBF Italy) and the Gianfranco Campobasso Association co-organize the Conference “The metamorphosis of cooperative credit”, which will be held in Naples on 6-7 October 2017. Continue reading Conference “The metamorphosis of cooperative credit” – 6th and 7th October – Naples – Save the date! The European Society for Banking and Financial Law organize the conference “Banking and financial Law to the Test of Supreme Courts” which will be held in Nice on 17th November 2017. 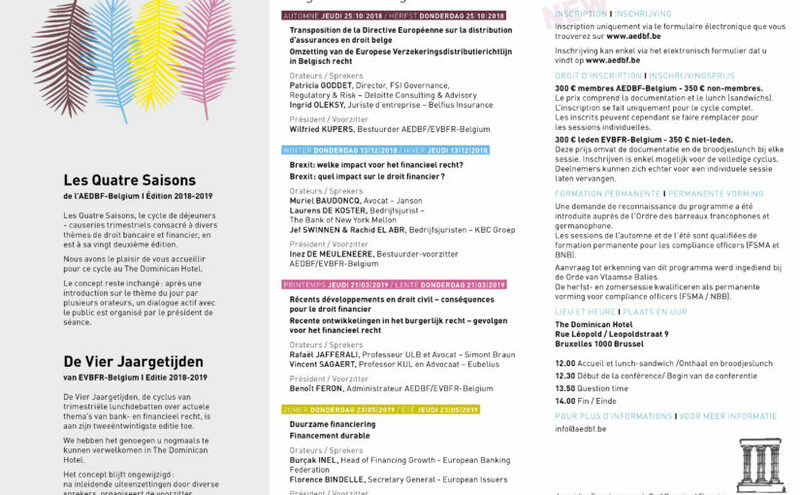 AEDBF Belgium and ForumCompliance.be organize a conference on MiFID II and MiFIR.